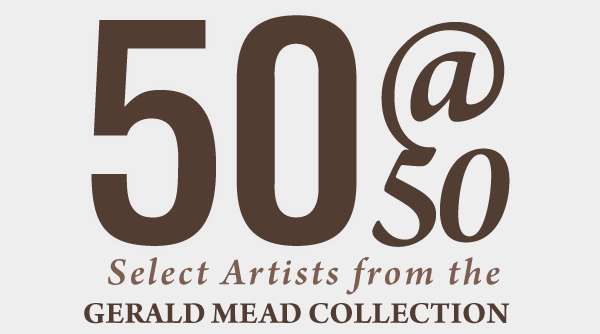 50 at 50 Select Works from the Gerald Mead Collection opened August 18th 2012. 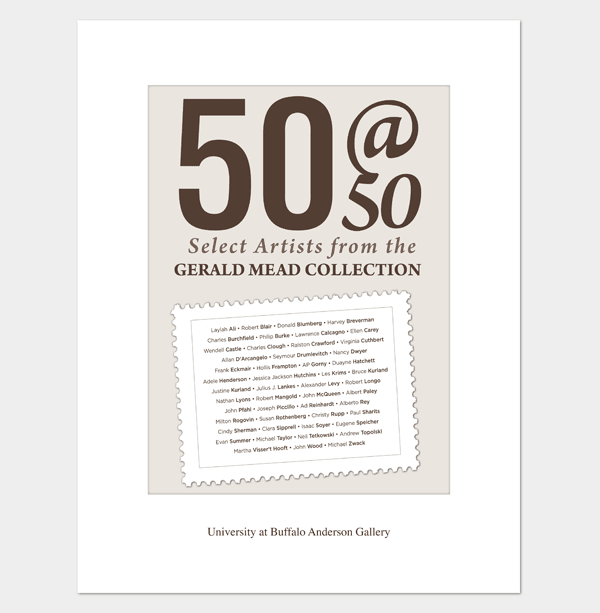 I designed a postcard and an exhibition brochure/visual checklist for an exhibition of select works from fifty artists in Gerald Mead’s personal collection at the University at Buffalo Anderson Gallery. This project was great fun, I always love working on anything for the fine art field, books, exhibition promotion, brochures, vinyl graphics for walls, or whatever comes my way. 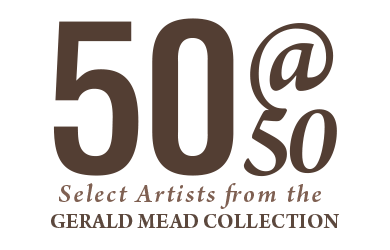 The concept for this promotion was to make one piece of work from each artist in the exhibition into a stamp to draw a connection between stamp collecting and collecting art. After nailing down the exhibition logotype we moved on to work through many concepts for how the stamps would be organized and look on the page, some samples of which I show below. A bunch of the better logo sketches that I worked through. A bunch of the better postcard/brochure covers that I worked through. The final postcard front and back. 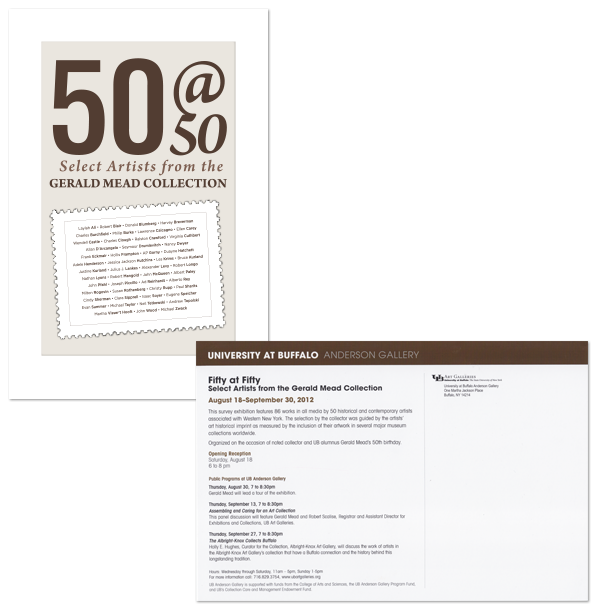 The front was designed and sent to the design team at UB to add all of the information that both pertained to the show and information about other events that they are hosting, then was sent to the printer. The final design implemented on the front cover of the brochure. Now that we have worked through the logotype and covers, we will move on to the stamps and inside brochure design. The over arching idea for the inside of the brochure was to show each piece as a stamp. Much like stamp collectors obsess and agonize over which stamps they collect, how they find and buy them, which ones they choose to acquire for their collections, and how to display their collection, Gerald chooses who to collect with a very specific standard that they must fall within. 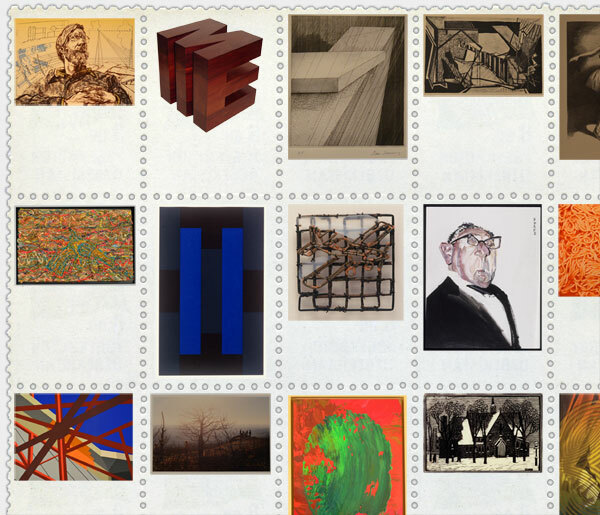 The following shows some of the process of exploration and finalization of how to display the works as stamps. The original idea for the stamps was to create 3 separate plates for the three inside panels of the brochure. Stamp A & Z would be on the introduction page, leaving three evenly split plates with sixteen stamps each. As you can see above this idea did not really work out, though having all of the plate location, plate and registration information, and the title plate would have been a very nice touch, it simply would not work out due to the varying ratios of the pieces of art, which we wanted to end up all about the same size. As illustrated above this could not happen if we moved forward with this idea. At this point we went back to research and looking back at personal and family stamp collections. This research brought forward the solution of creating pages of stamps with the title of the collection printed directly on to the page. 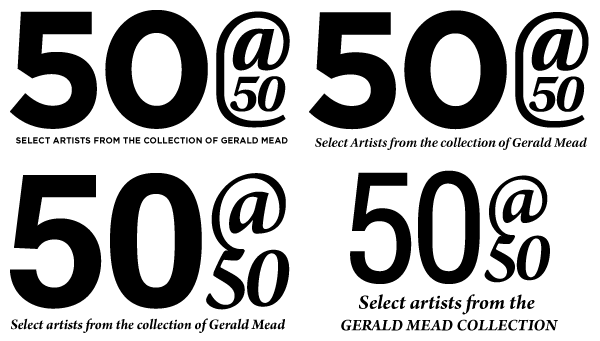 This solution gives the illusion of the stamps being part of a larger collection (eluding to the greater collection of the Art Collector who owns these pieces) while still being a solid collection on its own (eluding to only the pieces that were chosen to be shown in this specific exhibition). Making each piece into a stamp and bringing it to the same size almost makes each piece equal in importance no matter who the artist is or how respected they are they are all an equally important to the collection. After deciding how the stamps would be treated we moved on to stamp design. This phase of the project brought us to two different answers. 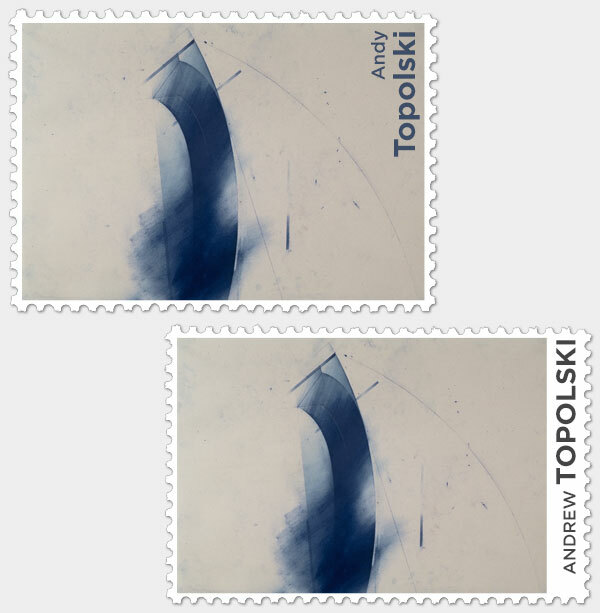 We loved the idea of making the piece of art the full stamp, but because we did not want to disrespect the art in any way and because there were a couple of pieces where it would not work we decided to make the piece of art and the artists name as separate elements on the stamp. Final inside layout, a three 8.5 x 11 inch panel layout. 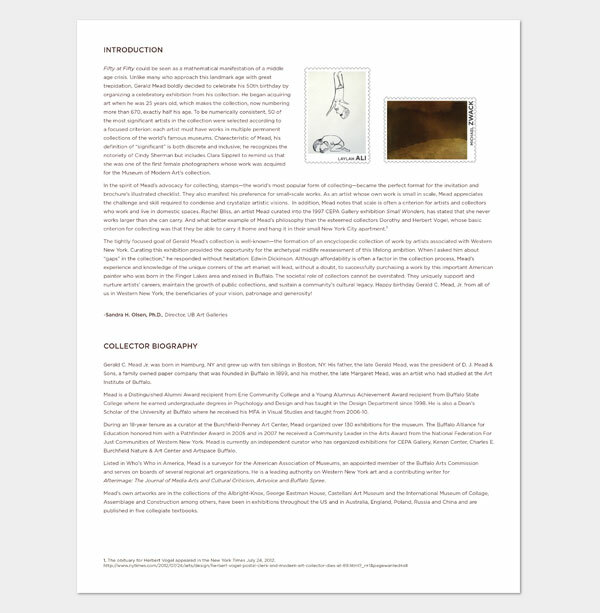 A short exhibition essay and collector biography are both shown above. 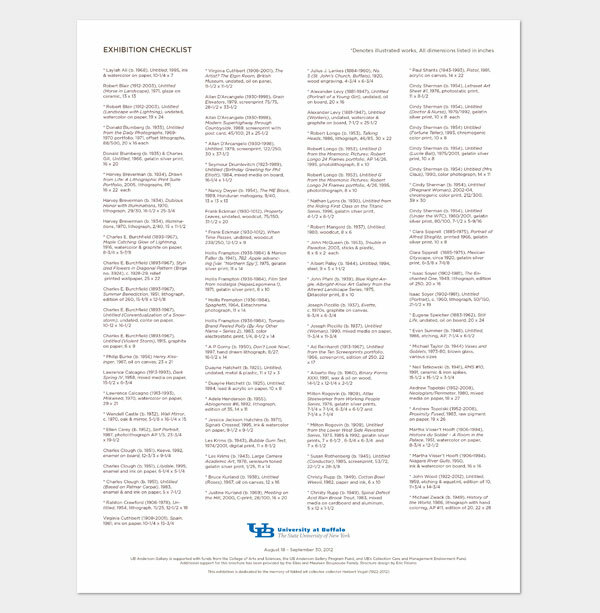 The back of the brochure contains a complete list of all of the pieces in the exhibition. Through this project I learned a ton about Western New York artists and art history, not only was it a fun diversion from the daily monotony of working on the same boring projects for months on end, it was also a great opportunity to learn and grow as a designer and art lover.